Early Practice · Three ringers: Carroll, Nancy, Thomas. We raised all eight bells, in a harmonious sequence: 148 (fCF), 246 (ECA), 237 (EDG), 357 (DBG). Nancy worked on some problems that have snuck into her ringing motion, blocking her followthroughs, causing too tense and tight of her left hand’s grip on the tail, delaying her pickup, and separating her hands particularly from handstroke to pickup. We tracked back to one cause, Thomas’s unclear statement of the “wringing out” of the rope and sally as one pulls, which we now see has to be presented as a sensation to feel, not a motion to actually make while ringing. She made much improvement but there’s more to do. Judy and Marguerite arrived about 6:15 so we were able to ring Rounds on Five on the light five. Practice · Seven ringers: Carroll, Jody, Judy, Ken, Marguerite, Nancy, Thomas. Anne’s bicycle had a flat tire on the way to practice which prevented her attendance. Former ringer Malu visited, and pulled a rope for the first time in a couple of years, but did not ring. Rounds on Five, then Six, then Seven. We rang on the heavy bells, standing and rotating one bell to the right every so often. Full Pull then Stand, in most rotations of the ringers around the bells. Plain Hunt on Five with tenor behind. Nancy tenored while the senior ringers worked on their hunting. Now that our striking has improved and we have more senior ringers at practices, we will be devoting more practice time to this. We plan to run Hunting like we run Rounds, standing and rotating one working bell to the right every so often (leaving the tenor ringer in place). Four ringers braved the road closings for the Marathon: Anne, Judy, Marguerite, Thomas. Anne biked to the tower. We raised 1234. Learner Amy visited briefly and observed. Call Changes. Thomas called for a while, then Judy called. A metal doorframe and self-closing wooden fire door has been added to the spiral stairs. There is no doorknob at this writing. 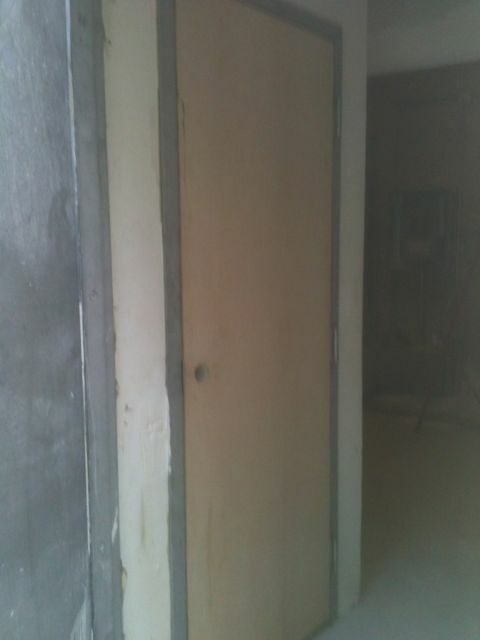 Update: Although the door has veneer surfaces, it is a code-rated fire door as shown by an information plate on the hinge face and verified by Ken. The interior of the door is a mineral substance, visible in the doorknob mounting hole. Springs in the hinges swing the door shut with a loud bang, so watch out. Early Practice · Three ringers: Carroll, Judy, Thomas. We raised all eight bells. Carroll worked on raising, ringing form, and setting. Practice · Six ringers: Carroll, Judy, Ken, Marguerite, Rob, Thomas. New learner Bobbie watched and listened. Rounds on Four on the middle four (3456). Rounds on Five on 34567, then 23456, standing periodically and rotating one bell to the right. Rounds on Six on the light six (123456). Rang down the heavy five in peal (45678), then the light three (123). After practice some of the band adjourned to a nearby pub. The tower door and frame have been replaced, ending the concern that we might be unable to get in to (or back out of) the tower appear to be usable. Jim and workmen were in and out of the tower several dozen times today without difficulty. We duct-taped the bolt’s plate against the door meanwhile to keep it from catching on the door frame again. The door and frame will be replaced at a later date, as part of other work on the bell tower including the addition of a non-locking interior fire door for the spiral staircase. The Miami Marathon will close 15th St NE between the Venetian Causeway and North Miami Ave (course map). Ringers will have to allow extra time and possibly alter their route. As usual, the best approach will be from the north via Bayshore Drive, entering the Cathedral grounds from the gate on 16th Street. 15th St and the Venetian Causeway will be closed. No access from the south via Biscayne Blvd or the exit from I-395 (MacArthur Causeway). The best approach is from the north (see “Getting to the Cathedral on Race Days” map), aiming for N Bayshore Dr and the NE 16th St entrance. Update: this morning between 9:00 and 10:00am the intersection of Bayside Dr and 16th St was blocked by drivers were sitting in their cars, or in at least one case cars whose drivers had left them in the traffic lanes. People trying to reach the Cathedral had to ask the drivers to move or drive on the wrong side of Bayside Dr to get to 16th St.
Road race courses usually do a “rolling re-open”, with each segment of the course re-opening as the last runners either clear it or are picked up by the slow-runner van and ferried back to the staging area. 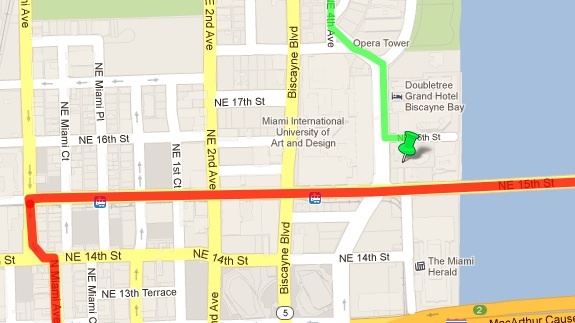 The Miami Marathon starts at 6:15am, with the Cathedral at roughly the 10.5 mile point. The wheelchair competitors and fastest runners will have passed by around 7:15am, but based on last year’s experience there will still be a steady stream of slower runners and walkers until about 10:00am when the rolling re-open will reach the Cathedral. Update: walkers were being cleared off 15th St at 10:00am. The course makes a loop around most of South Beach, making egress a problem. It is likely that I-395 (MacArthur Causeway) will be open by 8:00am, but of course the tower won’t be reachable from the usual I-395 exit; plan to drive around by I-95 and I-195 to the Biscayne Blvd exit north of the tower.